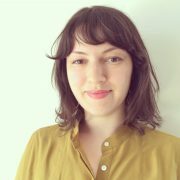 Katie Vida is an interdisciplinary artist and curator based in Brooklyn, New York. Known for her performance and sound work, Vida received a BFA in Painting from Rhode Island School of Design and an MFA in Painting from Yale University. Her work has been widely exhibited including at ALLGOLD MoMA PS1, Yale University Art Gallery, and Dalhousie Art Gallery in Nova Scotia.